Two days ago on February 9th McClatchyDC reported that an air cargo shipment of 19 Assault Rifles with telescopic sights, 118 rounds of ammunition, and 50 military radio antennas had been seized by the Venezuelan Government. A Bolivia National Guard General, Endes Palencia made the report which Venezuela's embattled Maduro government has not commented on. The aircraft was operated by the company 21 Air on a regular direct flight from Miami international airport to Valencia airport in Venezuela. The schedule and loading times can be seen on the second line in the chart below which was taken from 21 Air's sister company, a global air cargo integration and booking service called 21 Cargo. 21 Air sent out a quick barrage of press releases claiming they have discontinued flights to Venezuela until there is some clarification, which probably means change of government, about the situation. Business Insider turned the press release into a softball story but noted the FAA registration number of the Boeing 767-241 as N881YV. That aircraft is actually registered to a leasing company, JW Aviation LLC. JW Aviation does lists 21 Air, 21 Cargo, and Solar Air first on it's website amongst it's customers. Solar Air is the former name of 21 Cargo prior to 2014. The other listed customers include Avianica and the Air Forces of Brazil and Columbia. The Boeing 767-241 model is a specific model made by Boeing exclusively for the now defunct airline Varig in Brazil. A total of nine were built. Write ups on the company say that it only owns and operates two aircraft, both Boeing 767-241 models and plans to acquire 5 more. An image search yeilded pictures of two other aircraft bearing 21 Air's paint scheme. The aircraft most commonly seen has the tail number N999YV and is also registered to JW Aviation LLC. The second most commonly seen is the previously mentioned N881YV. There is however a third tail number in the mix. Seen below at an airport in Paraguay is another 767 with 21 Air markings. Note the tail number. As can been seen, the tail number is 768QT. This is a false number. The tail number 768QT is a Phantom 2 Vision Plus not a Boeing 767. This particular number belongs to a film making quad rotor drone owned by Truman University in Kirksville Missouri. Below is a screen capture of the FAA registration and a sales photo of the drone are provided below. So far we have an aircraft leased from one company to another flying what amounts to an assassination squad starter pack to a country that the United States is openly hostile to and has one of the largest proven oil reserves in the world. The operating company also openly and internationally operates at least one aircraft with a false registration number. The CIA predictably has no comment. Arms export, which includes both guns and the radios, without a specific license in a crime. The Department of Homeland Security has declined to state if there is going to be any investigation at all. It is also a violation of the Neutrality Act of 1793 to participate in the overthrow the government of or any attack on a country with which the United States is not at war. The cargo was chartered by a freight forwarding company called GPS Air. This simply provides yet another company to deny they had any idea that there were guns, ammo, radios and sniper sights on the aircraft. GPS has not said who they were forwarding freight for and as we have seen the Department of Homeland Security does not seem to care enough to ask. While there is no direct smoking gun link to the CIA from any company, aircraft, fake company, fake aircraft, or unexplained cargo client, there are indirect links between 21 Air and CIA black operations. Prior to founding 21 Air, majority owner Adolfo Moreno owned two companies that shared an address with Gemini Air Cargo. Gemini Air Cargo was one of many small private aviation companies known to be utilized by the CIA for extraordinary rendition flights, where people are taken to overseas black sites for brutal interrogation on what is know as the torture taxi. Michael Steinke, 21 Air's director of quality control since the inception of the company, also worked at Gemini Air Cargo in 1996 and 1997. A director of quality control seems to be a key position to know when a sketchy box of guns is loaded onto one of only two aircraft your company proports to operate. Having a legal tail number on your aircraft would also seem to fall under any quality control departments area of responsibility. Since not one other news source will say it directly, The Mockingbird will right here. 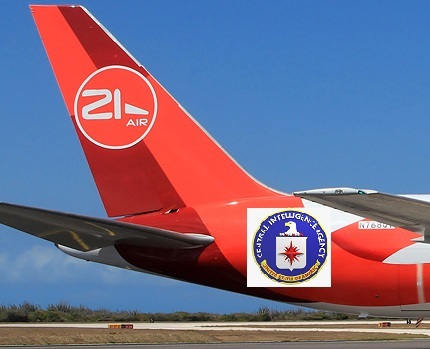 21 Air Cargo was caught smuggling guns as part of a CIA black operation aimed at toppling the government of Venezuela. As the memes say... Change my mind.